In recognition of the inauguration this week, I have listed what I consider the best presidential portrayals on film and the small screen. My criteria are simple. Did the actor capture the spirit of the President’s personality? And, was I able to watch the presentation without being aware that someone was trying too hard to play that particular president? Most of the performances on this list present a narrow window in a President’s life. The more difficult portrayals involve playing the person over a lifetime. A good example of this is Paul Giamatti’s portrayal of John Adams and Barry Bostwick’s performance in the George Washington miniseries. Below is the actor followed by the President portrayed and then the film or television title. I was skeptical before making time to see this show that the actor could pull it off. I was wrong. Kenneth Branagh captured the force of Roosevelt’s personality and his physical and emotional fight with the crippling polio disease. He also does a great job of relating to the people who have the same disease while rehabilitating at Warm Springs. His supporting cast is terrific and he shows us why Roosevelt related to so many people. Enough has been written about Lewis’ choice concerning how Lincoln sounds when he speaks compared to other portrayals. If you watch Henry Fonda’s “Young Mr. Lincoln”, the voice pitch comes close to what Lewis used in Lincoln. What cannot be disputed is that he does capture Lincoln’s modest confidence and his sharp political mind. Paul Giamatti captures Adams from all directions. He is spot on in his portrayal in many aspects. His love for his wife Abigail, his mercurial temper, his difficult personality, his love for his family, his ego, and most of all, his sense of duty, fairness, and love for his country. Giamatti’s choices show the president from all sides while weaving his multi-layered personality into the presentation of Adams. He also plays him as he ages from a young man to his death which is difficult to accomplish. Langella’s acting puts a human face on Richard Nixon in this Ron Howard directed film. He sparred with David Frost through a majority of the movie and showed Nixon’s toughness, intellect, political savvy and his personality weaknesses. This performance is remarkable because it keeps the audience interested despite knowing the outcome. It explains history without getting into the minute details so the audience’s eyes don’t glaze over like sitting in 9th grade history class memorizing dates. Jeff Daniels does a terrific job showing people what it must have been like serving under George Washington. Daniels gives us a performance that shows Washington cool under fire, a master at finding quality people to serve under him and how to manage them, and how to get soldiers to fight for him in the most extreme circumstances. Daniels as Washington shows the General as calm leader looking to find answers instead of assessing blame. My favorite scene in this movie is when Adams is supposedly sleeping during a congressional session. Then the speaker asks him to comment on the previous discussion. Adams speaks up immediately repeating the last exchange and giving his own caustic opinion about the matter and the current session itself. Hopkins is a master at losing himself in roles and this is one. His other Presidential portrayal of Richard Nixon is good as well but this one is fascinating especially with the final summation in court at the end. Randy Quaid shows Lyndon Johnson with his loud voice, over-the–top personality and his energy to accomplish his own goals and fix what needs to be fixed. This is another performance that shows the actor aging through several years from a young man to his days in congress. Quaid gives an outstanding performance showing how Johnson dealt with people and how Johnson used his force of personality to get his legislation passed when he was a leader in congress. This movie was released in 1939 and it shows a young Henry Fonda at his best. Fonda gives us the Lincoln personality in the salad days of his lawyer career. He takes on a case early in the movie that everyone believes is a lost cause. Throughout the movie, Fonda shows the audience the Lincoln wit and his art for storytelling. He shows us why Lincoln became President while using his political savvy and intelligence. Fonda’s acting also shows us an underlying sadness to his personality and an innate understanding he might be destined for great things. Those are my favorites. Do you agree? Leave a comment? The desire of nations and societies to expand their land holdings has caused much consternation in many countries. The United States and Australia never had a monopoly on the ill-treatment of indigenous people. The Persians conquered the Middle East, the Mongols rode across Eastern Europe, the Greek and Roman Empire sought to expand their cultures and the French, Spanish, and British monarchies sailed across the Atlantic Ocean to the New World. At the least, the United States and Australia’s failures to initially blend their opposing cultures upon colonization demonstrates a poor decision-making process to fix an issue before blood is spilled. Research and the record indicate that the treatment of indigenous people was cultivated in a divine belief in a God-given right to civilize “savages.” This belief gave the conquering colonists the right to do what they needed to further the nation’s promise. Although some may have acted with pure intentions, for others this belief gave them license to act unfairly and with malice. The United States’ policy of Manifest Destiny resulted in wars, forced relocation, cultural indoctrination and a distrust that has remained to this day. The story of the Australian Aborigines’ struggle and the British Colonization mirrors that of the Native Americans fight for recognition. For both countries, it took several deaths on both sides for each to realize that conciliation and compromise might be the best route for a sustained peace and understanding. That this atmosphere is continually tested by both sides is a testament to the deep-rooted scars from a turbulent history. What is clear today is that an understanding developed among the first colonists and subsequent government power elite in both countries that the idea to treat indigenous people as second-class or worse was acceptable toward a united nation under predetermined religious beliefs and races. This idea permeated society and gave the majority of “civilized” society permission to treat Native Americans and Aborigines how they pleased. Not everyone thought this way but enough to give both governments the power and permission to keep certain rights and land away from them. From then on, the “original” people from both lands would have to struggle to get them back. These rights would be earned one by one over several years by intellectual discussions, casualties from conflicts, government enlightenment and mutual compromise on both sides. This leads us to where we are today. The relationship is being repaired but disagreements remain between each party. This may be the price for how each land was settled at the start—a continuous process of reconciliation and compromise that may lead to total harmony one day. What do you think? Is it a valid comparison? 1770-1788-More British ships appear and dock on the east coast. 1621-One the first treaties between Plymouth Pilgrims and the Wampanoag Tribe. Colonists seek to expand further West from coastal region. 1788-British set up penal colony. 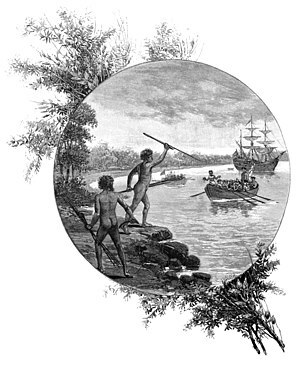 Skirmishes between British and Aborigines begin. 1830-1840-Native American Nations were forced to move from East to lands west of the Mississippi River. 1799-Aborigines resistance to white settlements in areas known as Black Wars 1838-Trail of Tears. Thousands of Cherokee forced to move from Georgia to Oklahoma with many dying in the process. This despite Supreme Court Rulings in 1831 and 1832 stating that they had a right to stay on their lands. 1835-The Dunghutti people of north coast NSW are now confined to 40 hectares (2,47 acres) of land on the Bellwood Reserve, near present day Kempsey. They previously owned 250,000 hectares. On January 12, 1833, a law was passed by US Congress making it unlawful for any Indian to remain within the boundaries of the state of Florida. 1949-Aboriginal people are given the right to enroll and vote at federal elections provided they are entitled to enroll for state elections or have served in the armed forces. On June 2, 1924, Congress enacted the Indian Citizenship Act, which granted citizenship to all Native Americans born in the U.S. the right to vote. Many states were slow to grant the right to vote by placing restrictions on eligibility. The 1965 Voting Rights Act strengthened laws prohibiting state restrictions on voting rights. 1979-Aboriginal people are counted in the Census for the first time. 1860-Native Americans identified for the decennial census. Census instructions indicate that the families of Indians who have renounced tribal rule, and who under state or territory laws exercise the rights of citizens, are to be enumerated. The 1870 Census is the first to list “Indian” as a choice. 1992-The High Court of Australia hands down its landmark decision in Mabo v. Queensland (Mabo Case, Mabo Decision). It decides that Native Title exists over particular kinds of lands – unalienated Crown Lands, national parks and reserves – and that Australia was never terra nullius or empty land. 1924-The Citizenship Act gives Native Americans dual citizenship. This enables Native Americans the status of US citizens and also be members of their tribes.1968-Congress passes Indian Civil Rights Act. 2007-Seneca Indian Nation revokes agreement to build highway through their territory in New York. The human toll these countries have paid due to both of them being a political football throughout the last century into the current one is staggering. The estimated death toll for the Vietnam Wars just from 1959-1975 is 58,000 US troops, 1.1 million of the North Vietnamese Army, and one-half to 2 million civilian deaths. If estimates include Cambodia and Laos, the death toll rises to more than five million. Afghanistan’s death toll numbers from 1979-2001 have been estimated from one-and-a-half million to more that two million. After 2001 to the present, the cost in lives for US forces is more than 1500 with an additional 20 to 50 thousand civilian casualties due to terrorist activity and the consequences of using modern warfare weaponry. These numbers are always being revised upward and in the case of Vietnam, the numbers don’t include the casualties that were inflicted during World War II and afterwards with Ho Chi Minh’s rebellious war with the French supported by the Soviet’s and Chinese communist governments. Comparisons between Vietnam and Afghanistan are easy to understand. After all, the Soviet Union military leadership was discussing ways to get out of Afghanistan as early as 1980 due to tribal disputes, the difficulty and lack of mountain warfare training, and the strong Mujahideen force combating against the Soviet occupation. However, like the United States in Vietnam twenty years before, the muddy politics and refusal to understand the local culture thought process prevented them from acting on that understanding quickly. The sad history about the Soviet invasion into Afghanistan and the 30 years since is that women in the country were enjoying more freedoms and educational opportunities before 1979. Since the invasion, the civil war, and the Taliban control, those freedoms were stripped away and in its place abusive restrictions became normal procedure until the invasion of Afghanistan in 2001. Since the invasion, the progress toward more freedom for women has been slow but noticeable. What is interesting to note in the timelines below is that Vietnam was unstable and volatile early in the last century but is now is relatively steady with economic opportunities. Afghanistan is just the opposite. The country was relatively sound early in the last century but was thrown into turmoil later on and into the current age. Another commonality with both wars was the formation of resistance fighters. One fought against Soviet occupation in Afghanistan, the Mujahideen, while the other, The Viet Cong, the communist organization in Vietnam, waged war against US and other NATO forces. Both civilian populations played a part in accepting or covertly disrupting operations. Both wars, especially before 2001, were proxy wars funded by superpower money and weapons, sometimes masked and filtered through their allies. The initial social and tribal readings by intelligence analysts underestimated local politics and influence by local leaders in both wars. The Soviets misread the conviction of the Mujahideen and the influence of Islam throughout the nation. In addition, the PDPA, the communist leadership, was never as unified as the Soviet Politburo leaders were led to believe before invading on the request of Afghanistan PM Amin. As with Vietnam, the diplomatic and government phenomenon of mission creep occurred for the Soviet military, the Soviet army initially occupied the country to protect cities and installations. Over time, the army, composed of reservists and regulars, began to engage in combat missions that expanded. Like the US in Vietnam, the Soviet Army had to fight a guerilla war they were not prepared to prosecute in the beginning. They were fighting against rebels who knew their own terrain. There are differences between the present Afghanistan War and the Soviet Union invasion. The US war in Afghanistan is retaliation against aggression from elements inside the country on September 11th, 2001. The US force went in knowing the units had to fight in addition to securing cities and installations. Military leaders also had studied Afghanistan terrain, the climate, and tribal politics in addition to the lessons learned from the Soviet occupation. The US leadership didn’t say this at the time of the invasion, but the fight on terrorism was a long-term commitment to Afghanistan. That meant, if necessary, they were willing to stay past 10 years in the country to secure the region. I can write for days concerning this topic. If you have any comments or notes, please post them. I am looking forward to reading other ideas about this topic. 1913-1920 1919-Afghanistan regains independence from British occupying forces. 1933-1945 1933-Zahir Shah becomes King and Afghanistan remains a monarchy for the next four decades. 1945-1953 1953-General Mohammed Daud becomes prime minister with King Shah a figure-head and implements many social reforms. Gen. Daud asks for help from the Soviet government. 1954-1961 1956-Soviet Premier Nikita Krushchev agrees to aid Afghanistan and the countries become allies. Daud’s reforms include women attending university and working. 1960-1963 1963-Daoud’s social reforms continue agitating the conservative religious community. 1964-1968 1965-The Afghan communist party forms. 1976-1979 1978-PM Daud is overthrown and killed by the leftist People’s Democratic Party during a coup. Hufizullah Amin wins a power struggle, becomes president. The People’s Democratic Party (PDPA) struggle for power. 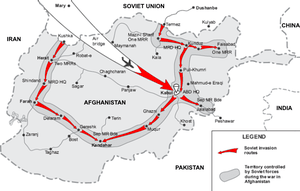 1979-The Soviet Union occupies country at the request of Afghanistan’s communist party leaders. 1979-2001 1980-With occupying Soviet troops supplying power, Party Leader Babrak Kamal becomes the countries leader. 1980-Afghan Army soldiers defect to Mujahideen rebel force, led by Ahmad Massoud. 1980-US and other nations supply rebel forces. 1986-US supplies stinger missiles to rebels to shoot down Soviet air power. 1988-Last of the Soviet troops leave Afghanistan. 1996-Taliban seize control of Afghanistan and carry out harsh Islamic doctrine controls. 9-9-2001-Massoud assassinated by suicide bombing. 9-11-2001-Terrorist attacks on US Soil. 2001-US and Great Britain launch invasion of country after it refuses to hand-over Osama Bin Laden, the master mind of the 9/11 attacks on US soil. 2004-Democratic elections held in country, electing Hamid Karzai as President. 2012– Continued US and NATO presence in the region. Karzai still in power. Taliban force strength reduced but still launches attacks from mountainous region bordering Pakistan. 1933-1945 1940-Japan invades Vietnam. 1941-Ho Chi Minh organizes pro independence league. 1945-Japan surrenders. Minh declares independence and unites all French colonial provinces to form Vietnam. 1945-1953 1946-National Chinese, French, and Viet Minh struggle for control of the Viet Territory. 1946-Beginning of First Vietnam War between French and Viet Minh. China and USSR back Viet Minh. US back French to stop the spread of communism. 1954-1961 1954-Viet Minh defeat French at Dien Bien Phu, leading to Geneva negotiations diving Vietnam at the 17th Parallel. 1960-1963 1960-National Liberation Front (Viet Cong) forms to fight against US Forces and President Diem. 1963-US supports military Coup against President Diem. Diem’s murder during the coup leads to a number of successive leaders. 1964-1968 1964-Gulf of Tonkin Resolution give President Johnson war powers. 1965-US Combat Troops arrive in Vietnam (Second Vietnam War). 1968-Tet offensive launched by Ho Chi Minh and Viet Cong. 1969-1975 1969– Ho Chi Minh dies. 1973-Nixon and Kissinger negotiate peace treaty. US withdraws a majority of troops. 1974-President Ford balks at sustaining aid to South Vietnam Forces. 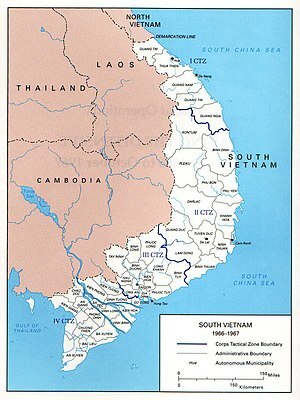 1975-Viet Nam unified under communist rule after taking Saigon, which they rename Ho Chi Minh City. 1976-1979 1978-Vietnam invades Cambodia, trying to take over from the Khmer Rouge. Tensions with China increase. 1979-2001 1986-Vietnam revises strategy and commits to social and market reforms. 1995-Diplomatic relations normalized between US and Vietnam. 2001-Present 2010/2011-Academic year-More than 14,800 students studies at US colleges and universities. 2012– Trade between US and Vietnam continue to increase.